We are a small, enthusiastic land surveying company equipped to survey over hill and dale and into the city undaunted by bugs, wetlands, and traffic. Thorns, tall fences, no trespassing signs and mean dogs, and owners will however slow us down. We specialize in determining property line boundaries no matter if we are working the streets of Boston or the usual residential lot lines in towns and cities, or the occasional old farm in Massachusetts, Maine or New Hampshire (family divisions are popular in Maine.) Proper chain of title research is often critical to determine senior rights (as opposed to lot line determinations in subdivisions where all the lots were created at the same time eliminating senior rights). This chain of title research normally identifies the true facts about possible lot line overlaps and/or gaps to establish the original surveyed boundary line locations and resolve contentious boundary line disputes or simply complete a standard boundary field survey and plan. We're not intimidated by in-depth subject lot and abutter deed and probate record research back to when a particular lot was created (sequential conveyances). This sometimes requires running the chain of title back into the early 1800's to find the necessary metes and bounds lot line descriptions information that became lost through time turning into nondescript deed description conveyances conveying property by describing boundaries with abutter names only (i.e. along so & so, lacking distance and bearing information). This in-depth research will reveal any recorded easements affecting the subject properties, possibly benefiting it or subjecting it to rights of others and quite often bring to light mini land area conveyances deeded out to an abutter or into the subject property and recorded in distant past and forgotten about. Member New Hampshire Land Surveyors Assn. 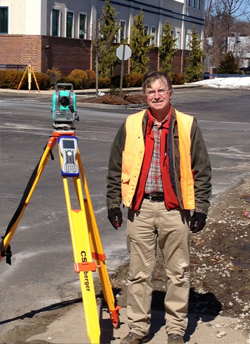 Licensed Land Surveyor: Kimball Chase Co., Inc. Most residential lot lines and subdivision boundary line determinations don't require much research, just enough field survey work to re-establish the outside perimeter boundary of the particular subdivision. This is done in order to calculate the interior lot layout as dictated by state law (for subdivisions) or identify the boundaries by monuments, distances and bearings called for in the subject lot deeds and supported by matching information in the abutter deeds and thence located/found. We also specialize in road detail mapping and commercial property surveys with topographic elevation features required by civil engineering design firms who design and re-design roads, sewer lines, water lines, and parking site designs to name a few. Our field survey data collection includes in-field drafting by programming in line work such as curb lines, paint lines, edge of pavement, drainage flow paths and structure symbol items like sewer manholes, trees, catch basins, water shutoffs, poles to name a few. When the field data is downloaded into an AutoCAD computer drawing in the office the line work is automatically drawn and symbols inserted instantaneously during download onto their specified drawing layer. This saves time in the office, minimizing budgets, drafting all these particular details. For civil engineers we include sewer and drainage structure inspections and measurements from rim to pipe invert. Some projects may require State Plane Coordinates and special elevation datum tie in such as (NGVD29) National Geodetic Vertical Datum of 1929. This in-field data collection drafting also works great for as-built surveys sometimes required by towns and cities to verify the road or site work was completed according to an approved civil engineering or architectural design. This said data collection also works well for ALTA/ACSM (American Land Title Association surveys) land title surveys required by attorneys for commercial property for the purpose of supplying the title company with survey and location data like property lines, setbacks and existing as-built details. These ALTA plans include delineation of easements benefiting or adversely affecting the commercial property and encroachments, all information necessary for issuing title or extended coverage title insurance.